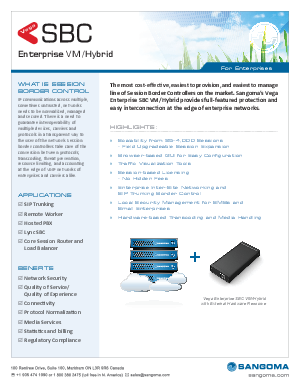 The most cost effective, easiest to provision, and easiest to manage line of Session Border Controllers on the market. Sangoma’s Vega Enterprise SBC VM/Hybrid is unique in the industry. It delivers the benefits of a VM Solution with a cost effective method of scaling up to 4000 sessions. It delivers full-featured protection and easy interconnection at the edge of enterprise networks. Features like a Browser based GUI for Easy Configuration, Traffic Visualization Tools and Session-based licensing can benefit your enterprise. Read this data sheet to learn more.